New River Dining: Lamb Chump... and a bag of beans. Lamb Chump... and a bag of beans. Oven roast lamb chump with roasting juices and an onion crumb, served with minted pea purée and sweet pickled red cabbage and garnished with wild garlic. I'd not even heard of lamb chump until Susan, who dined with us on Saturday, mentioned it. Rather embarrassed at my ignorance, I knew that a quick chat with Jim at F. Norman butchers in Oakwood was needed. 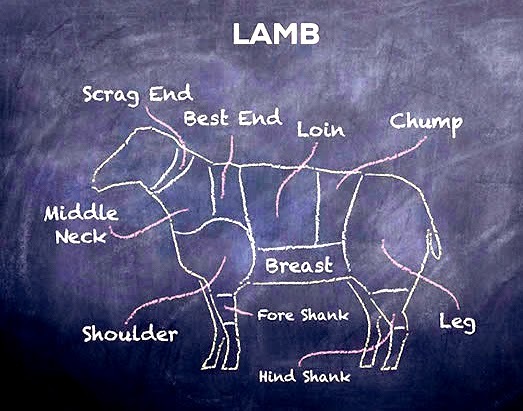 Lamb chump is basically rump steak but is often sold as chops. It comes from the back, next to the more expensive loin and rack. It prepares as a strange looking triangular joint, two to an animal with a thin coating of top fat that crisps nicely in a hot pan. The meat is beautifully tender and flavoursome when pink. There's a good chunk of meat here with no bone or sinew to spoil the eating. The shape of the joint presents some issues. the three corners will cook quickly. I decided to cook several joints (two will feed three people) and serve them sliced, ensuring everyone has some of the more tender central steaks. The joints were fat scored and seasoned simply. This is where a cast iron skillet comes into its own. The pan will retain its heat and sear the meat quickly. You want a short time in the pan to avoid cooking the interior. I was looking for a delicious, dark caramelisation of fat and flesh. My skillet was so hot that when I pressed the joints in, fat side down, the fat atomised immediately and caught alight. Phwoosh. Careful there. It's a little like what happens when I flame tomatoes, although there it's steam creating a hot fat aerosol that ignites. I seared all sides, removed the joints and deglazed the pan with lamb stock. At this point the meat can be put aside until guests arrive. The final stage is to place the joints back in the skillet or a small heavy, roasting dish and place in a 220°C oven for ten minutes. Time will vary slightly with the number of joints you cook. Maybe twelve minutes for six or more joints. The chumps should still feel springy when you take them out. Now remove the joints to a chopping board and rest for at least 15 minutes. Don't be tempted to cut them, or god forbid, serve them straight away. They need to relax (such a strange term for burnt meat) and retain their juices. Anyway, you now must turn back to the skillet. Deglaze using more lamb stock, scraping away at all the tasty sticky bits. I throw in some tomatoes at this point for some body and acidity. Bring to the boil with any meat trimming you might have and allow to reduce, then season with salt and pepper. You can serve this but I chose to add a few extra flavourings: some reduced port and a splash of l'Olivier cassis vinegar. How much? Who knows, it's all to taste. I realised this was going to be good when Etien, no fan of lamb, nibbled on a cut off corner. The quality pierced even his adolescent sang-froid. "Oh my God, try this." It was very fine. My guests agreed. Several declared it the best lamb they'd ever had. This is a dish I'm confident I will serve again and again. Their first time with us, Katie booked a surprise for her husband's birthday. And I mean a real surprise. The friends arrived first and hid in our garden. Meanwhile, Katie - who'd dropped off the alcohol earlier - told George she fancied a walk in the park. I've no idea what he thought walking into my house. He did look befuddled until the friends launched themselves from the garden. Another birthday for another husband. Self declared foodies, Susan was very specific in her menu requirements - I'm glad she was. This is often how I discover new ideas. On this occasion: lamb chump, wild garlic and passionfruit soufflés. I'll cover these last two items in other blogs. Saturday evening turned somewhat horizontal after dinner. Susan, suffering some post hip-op pain needed to sit flat and, at first, plonked herself down on the hard floor in the lounge. I wasn't having that so I offered use of our 'fat-boy' bean bag. Joints were eased. Her friends joined her in the lounge and took their wine Roman style. Some may even have had a restorative, post-prandial nap. Like I say: we're not a restaurant. The (NCT) human pyramid. And a little pancetta.